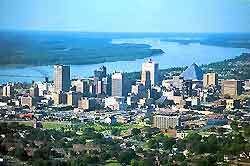 Memphis, Tennessee, is located next to the Mississippi River and is most famous for being the home of Elvis Presley. Graceland, Elvis Presley's estate in Memphis, is a popular pilgrimage for Elvis fans of all ages and is America's second-most visited house, attracting more than 600,000 tourists to the city each year, second only to the White House in Washington D.C.. There is plenty more to offer tourists in Memphis than just its numerous Elvis tourist attractions, with the city also being known for its blues venues, rock 'n' roll heritage, chic restaurants, historic museums, and also where Martin Luther King Jr. was assassinated in 1968. The city of Memphis has never been busier and the thriving economy has resulted in much of the city being renovated and redeveloped, including Beale Street, one of the most historic districts in the city, and Peabody Place, which is now full of shops, cafés and nightclubs. There are a number of worthy tourist information centers located in this city, with the Memphis Visitor Center on the Elvis Presley Boulevard serving as the principal outlet for tourism. Also very much of note is the Tennessee State Visitor Center on the North Riverside Drive, close to the Jefferson Davis Park and the Confederate Park, where staff will be happy to help you arrange your accommodation if necessary. Memphis contains a good selection of hotels, including many popular choices lining Madison Avenue, North Main Street, Ridge Lake Boulevard and Union Avenue. One of the most famous hotels in Memphis is the Heartbreak Hotel, part of the Graceland complex and named after Elvis Presley's hit record. For the cheapest lodging, consider staying on the western side of the city, crossing the Mississippi River and into the adjoining state of Arkansas, where chain motels line the I-40 interstate. Other popular hotels can be found close to the Memphis International Airport (MEM), situated next to the southerly suburb of Whitehaven. 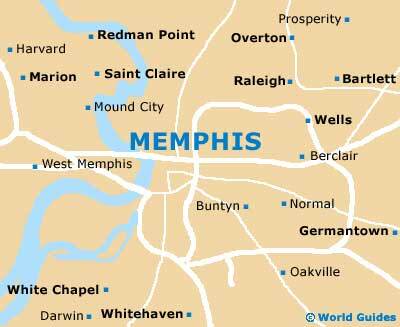 More information about Memphis Hotels. Memphis has many extremely popular tourist attractions, including Graceland - the premier attraction in this city and once home of Elvis Presley; the Statue of Elvis - situated on Beale Street as a reminder of the iconic Rock 'n' Roll star who once lived here; Memphis Zoo - including two giant pandas and regular animal shows; and Sun Studio - known as 'the birthplace of rock 'n' roll', being the studio where Elvis Presley first recorded. Other prominent sights in Memphis include The Pyramid - a 32-story pyramid formerly an arena hosting major events, now converted into a Bass Pro megastore that dominates the skyline; the Cotton Exchange Building - a grand building that was once an important part of the historic cotton industry; St. Mary's Episcopal Cathedral - standing in the downtown district with Gothic-style architecture; the Memphis Botanic Gardens - boasting a tranquil, landscaped Japanese Garden; Audubon Park - a large parkland popular with Tennessee locals; and the Tom Lee Park - a major spot for lively festivals and open-air music events. 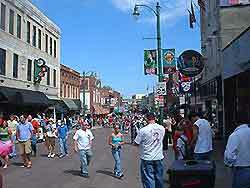 More information about Memphis Tourist Attractions and Memphis Landmarks. Memphis also has numerous superb museums and true cultural highlights. Some of these include the Rock 'n' Soul Museum - in the Beale Street district, filled with exhibits and historic information about the evolution of music in Memphis; the National Civil Rights Museum - housing information about the American civil rights movement; Peabody Place Museum - with an impressive collection of 19th-century Asian art and temporary exhibitions; the Pink Palace and Planetarium - a popular natural history attraction, featuring an IMAX theater and planetarium; the Art Museum of the University of Memphis - housing many temporary exhibitions of contemporary art and interesting antiquities; and the Brooks Museum of Art - a striking marble building filled with medieval art and an enormous collection of art from America and Europe. 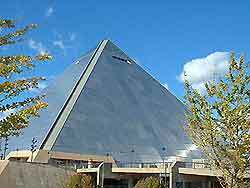 More information about Memphis Museums and Memphis Art Galleries. Tourist attractions located near to Memphis include the Casey Jones Village - the historic home of Casey Jones, a true railroad legend in America; the Delta Blues Museum - packed with information about the area's heritage of blues music; and the Mud Island River Park - educating visitors about the Mississippi River, with various related exhibits and regular guided walking tours. More information about Memphis Attractions Nearby.